« Our President sets a high–and ethical–goal for us. This picture of the grandeur of our Republic stirs our blood and our hopes, from the cheers and protocol of the President’s arrival to the first applause line in his speech. Then any idea of comity is shattered, as every Democrat in the hall leaps to his or her feet and cheers and applauds wildly, while every Republican sits stony-faced. The Democrats didn’t invent this show of love-hate: under George W Bush, the Republicans cheered and the Dems sat stony-faced. 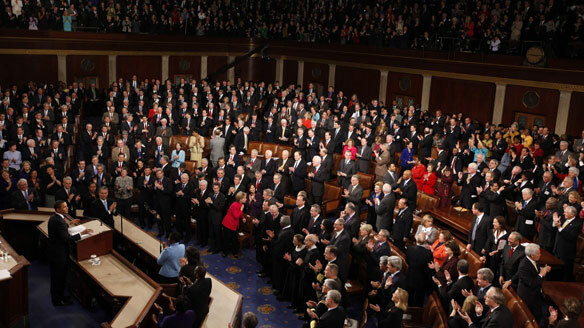 Now the tragedy of Tucson has inspired Senator Mark Udall (D-CO) to propose that the Speaker of the House as well as the majority and minority leaders of both houses of Congress sit together during President Obama’s State of the Union speech. Udall, wrote in his letter — addressed to Speaker John Boehner (R-OH), Senate Minority Leader Mitch McConnell (R-KY.), Senate Majority Leader Harry Reid (D-NV.) and House Minority Leader Nancy Pelosi (D-CA) — that political rhetoric has become especially “corrosive” lately and that sitting together during Obama’s speech would symbolize an end to heightened political hostilities between Democrats and Republicans. “Twenty-two senators and nine members of the house have signed the letter as of Friday afternoon and Majority Whip Kevin McCarthy (R-Calif.) has suggested he is open to the idea. Senate signers are as follows: Sen. Begich (D-Alaska), Sen. Barbara Boxer (D-Calif), Sen. Ben Cardin (D-Md. ), Sen. Kristen Gilibrand (D-N.Y.), Sen. Amy Klobuchar (D-Minn.), Sen. Joe Manchin (D-W.Va.), Sen. Claire McCaskill (D-Mo. ), Sen. Ben Nelson (D-Neb. ), Sen. Jack Reed (D-R.I.), Sen. Sheldon Whitehouse (D-R.I.), Sen. Ron Wyden (D-Ore.), and Udall for the Democrats and Sen. Kelly Ayotte (R-N.H.), Sen. Susan Collins (R-Maine), Sen. John McCain (R-Ariz.), Sen. Lisa Murkowski (R-Alska, and Sen. Olympia Snowe (R-Alaska) for the Republicans. In the House, all nine signers are Democrats. They are Bishop, Carney, Cohen, Matheson, Michaud, Pingree, Richardson, Ross, and Shuler. Sen. Joe Lieberman (I-Conn.), who caucuses with the Democrats, has also signed the letter. Would Republicans and Democrats sitting together for one speech end the political battles that have overwhelmed the Congress recently? Certainly not, but it would be a powerful symbol that America is one nation with one President. And that’s an idea that we have been losing track of lately. This entry was posted on January 15, 2011 at 1:30 pm and is filed under Ethics-general, Government, Politics. You can follow any responses to this entry through the RSS 2.0 feed. You can leave a response, or trackback from your own site. It’s a great idea. I wonder why nobody thought of it before. Why didn’t you think of it? Why didn’t I? Next question: I wonder if the Supreme Court skips it. I’ve long found it distasteful, but just assumed that it would always be that way. Udall didn’t make that assumption. As far as the Court, I’ve long believed that they don’t belong there, either applauding or sitting on their hands.